At Knapp & Roberts, our Phoenix car accident lawyers focus their efforts and resources on helping injured people and the families who have been seriously injured or killed in motor vehicle collisions (MVCs). Knapp & Roberts has been fighting to protect the rights of Phoenix car accidents victims like you since 1991. With more Southwest SuperLawyers and published Phoenix personal injury lawyers than most other law firms in Arizona, Knapp & Roberts is qualified to handle even the most complex car accident and collision cases. How do I know I’m hiring the right car accident lawyer for my case? How many car accidents happen in Arizona each year? What are some common causes of car accidents in Arizona? How do I prove who was at-fault in my accident? What type of compensation can car accident victims secure? How do you know the attorney you choose is the best to represent your car accident claim? First, look at the practice areas and case result history of the attorney. You will need a lawyer who specializes in car accident law, as well as one who has experience securing verdicts and settlements for clients. Caseload and response time are also important considerations since you’ll want a lawyer who can dedicate ample attention to your case. Look for an accident lawyer who has the time to speak with you about your crash, in person or over the phone. When discussing your case with a car accident lawyer, ask questions such as: “Who could be liable for my damages?”, “How much is my case worth?” and “Should I settle with the insurance company?” You have two years from the date of your accident to file a auto accident claim against the other driver and/or other parties. Don’t wait – contact us to talk about your recent Arizona car accident today. With statistics such as 126,845 vehicle collisions in Arizona in 2016, getting involved in an accident could be only a matter of time. Not all car accidents are serious, but 962 Arizonians died in crashes in 2016. Serious injuries such as broken bones and concussions can arise in car accidents, causing victims great pain and distress. The more you know about car accident laws and your rights as a victim in Arizona, the better you can protect your future after a car crash. When in doubt, contact a Phoenix car accident lawyer at Knapp & Roberts for assistance. 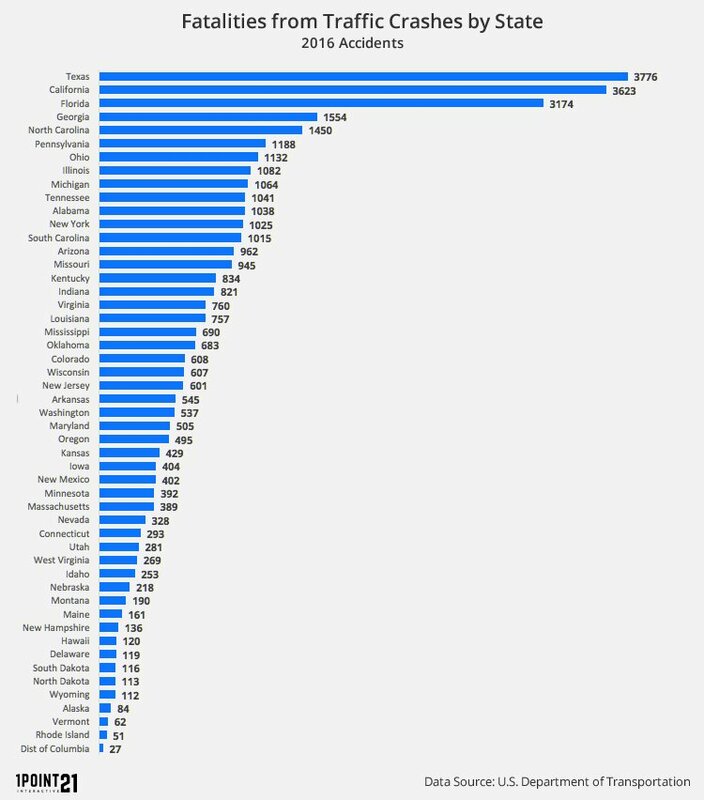 As evidenced in the graph above, Arizona is one of the deadlier states in the U.S. when it comes to car accident fatalities. According to the U.S. Department of Transportation, Arizona had 962 car accident deaths in 2016 – making it the 14th deadliest state in the country in terms of total fatalities. Drunk drivers in Arizona caused 31.19% of fatal crashes in Arizona in 2016, and 3.89% of all crashes. Drunk driving accidents are more common in Arizona’s urban areas than rural areas. Speeding caused a total of 45,452 crashes in 2016 in Arizona, or 18.38% of total accidents. Speeding caused 176 driver deaths and 14,388 injuries. “Speeding” doesn’t necessarily mean going over the speed limit. Rather, it means driving too fast for conditions. Breaking roadway rules. Aside from exceeding speed limits, drivers in Arizona are also guilty of failing to yield the right-of-way, following too closely, running stop signs, disregarding traffic signals, making improper turns, and breaking other rules and driving best practices. Driver impairment. Aside from drug or alcohol intoxication, a driver can also be too impaired to drive due to illness, physical impairment, or fatigue. In 2016, drowsy drivers caused at least 1,910 accidents in Arizona. Non-driver related causes. Not all accidents stem from driver error. Poor vehicle maintenance, malfunctioning car parts, bad weather, and dangerous roadway conditions can also cause car crashes. Recovering financial compensation for car-accident related losses requires an injured party to assign fault for the collision. Arizona is a “fault” insurance state, meaning the at-fault party will be liable for damages. If a driver is guilty of any of the above-listed acts of negligence, the driver’s insurance company will have to pay for the other party’s damages. In cases involving more than one at-fault party, the courts can assign percentages of fault to each. Overall car accidents in Arizona have had a steady increase from 2012-2016, and rose over 23,000 accidents over the 5 years. 2014 was the least fatal year of the time period shown, 709 fatal crashes in Arizona – a 73 crash decline from the year prior. Again, injury only crashes had a steady increase from 2012-2016 with 38,616 crashes in the most recent year. Rear-end collision. This type of accident occurs when one vehicle collides with the vehicle in front of it. Rear-end collisions are most common when a driver is distracted or speeding. Failing to stop in time to avoid colliding with a stopped or slowed vehicle almost always results in the liability of the driver in the rear vehicle. A sideswipe accident happens when two vehicles come in contact with one another while driving next to each other in the same direction. Merging into a lane without checking for other vehicles is a common cause of a sideswipe. Overcorrecting and swerving into another lane can also cause a sideswipe. Multi-car collision. A multi-car collision, or vehicle pileup, describes an accident that affects several vehicle vehicles. When one car strikes another, it can cause a chain reaction – particularly of rear-end collisions. If one driver is to blame for the multi-car collision, he or she will have to pay for all other drivers’ damages. Single-vehicle accidents. Every year, thousands of single-vehicle collisions occur in Arizona. Single-vehicle accidents can be the fault of the driver (e.g., a drowsy driver crashing into a ditch), but they might also be the fault of a third party, such as the manufacturer of defective brakes or the entity in charge of roadway maintenance. Regardless of the type of accident, it’s important to contact an attorney after a collision that causes serious injuries or expensive property damage. A car accident can change your life. You could be eligible for significant compensation after an accident depending on who or what caused the collision. How Do I Prove Who Was at Fault in My Car Accident? Proving fault is the number one goal for most car accident victims. Arizona is a fault insurance state, meaning injured parties can seek recovery through the at-fault driver’s insurance company. Injured people can also pursue compensation through a civil personal injury lawsuit. In both types of cases, the injured party will have to prove the other driver’s fault to receive compensation for medical bills, personal injuries, and property damage. Proving fault can be difficult depending on the circumstances of the accident. It requires reviewing all the facts and evidence of the crash to assign fault to one or more parties for causing the event. Evidence can include photographs of the scene, eyewitness statements, expert testimony, police reports, and medical records. An injured party will need to prove that the other driver owed a duty of care, breached this duty, and thereby caused the accident. Arizona is a comparative negligence state. This means that the courts might assign fault for a single car accident among more than one party. Even a plaintiff partially at fault for a crash could still receive partial compensation in Arizona. It’s important for an injured party to try to minimize his or her percentage of fault for maximum compensation. An attorney is a great resource to have when trying to argue one’s own shared fault for a car accident. Take pictures. Use your phone or camera to take photos of the accident directly after it happens. Take pictures of all vehicles involved, property damage, injuries, and of the roadway itself. Photographs can serve as strong evidence in a car accident case. Snapping a photo of fast food bags in the other driver’s car, for example, could help you prove driver distraction. Exchange insurance information. Stay on the scene and get the other driver’s information. Write down the driver’s full name, address, phone number, license plate, and insurance company. Give the driver your information as well. You don’t have to report your accident as a private citizen in Arizona, but police must report the crash if it caused injuries, death, or more than $1,000 worth of property damage. Contact an insurance company. Next, call the at-fault driver’s insurance company to report the crash. Don’t admit fault for the accident. Instead, wait for police or an insurance company investigation to assign fault. The at-fault driver’s insurance company will cover damages according to the policyholder’s coverage amounts. Call the number on the insurance card and follow the agent’s directions for reporting the crash. Don’t sign anything. You might hear from an insurance claims adjuster after an accident. The adjuster will ask you questions about the collision, and offer you a settlement. Do not agree to a settlement or sign anything until you’ve spoken to an attorney. The settlement could be much less than your case actually deserves. Signing something can make it difficult or impossible to argue for more money later. Hire a car accident attorney. Before you go any further with the claims process, call Knapp & Roberts for a free consultation. We can help you protect your rights and negotiate with insurance companies for a fair settlement. We might also recommend pursuing additional damages through a personal injury claim in Phoenix. An accident attorney can protect your best interests during settlement negotiations and/or a lawsuit against an at-fault party. It’s never too early to call an auto accident attorney. After a crash in Arizona, reach out to a Phoenix car accident lawyer from Knapp & Roberts as soon as you can for a case evaluation. Our car accident attorneys can walk you through the steps to take right from the beginning for your best odds of securing compensation. Always seek medical attention for injuries after a crash, and give us a call right from the hospital room if you want prompt legal assistance. The number for a free case review is (480) 991-7677. What Type of Compensation Can Car Crash Victims Secure? Knapp & Roberts offers a free initial consultation. If you have a legal matter you wish to discuss with a Phoenix car accident lawyer at no charge, please contact us by telephone or e-mail, or complete the “Do I Have a Case” form and one of our personal injury attorneys in Phoenix will contact you.